No, the MyPhone Agua Rio Fun is an Android phone. It uses Android apps and games from the Android Play Store which is an app on your phone. can arcmobile download a java games? Probably not. Looking at Arc Mobile’s website, I see there are many different models, most are Android which definitely doesn’t support Java ME. The few non-Android phones on the Arc Mobile site do not claim to support Java ME either. If you mean the MyPhone T18 Duo, it doesn’t support Java ME so the apps on BoostApps won’t work on it. If your phone supports Java ME follow the instructions in this post to download. If you mean the Cherry Mobile T18, it doesn’t support the Java ME apps on this site. Maybe, what make and model phone do you have? Do you have Nokia E5-00? You said E5-00-2 which doesn’t exist. You need paid data or Wi-Fi to download. If one app doesn’the work try a different one. Download using Wi-Fi to avoid data charges. Wattpad is available to download here. Type wattpad in the search box to find it. I don’t think so. As far as I know, the Itel It6520 does not support Java ME apps. My cellphone is have keypad can i downlaod it? Yes, as long as your phone supports Java ME you can be a these apps. It’s in the Play Store for Android. There’s no Java ME version. There’s no music here. But if your phone has a music player you should be able to download music From music download sites. can I download adobe in java? None of Adobe’s many products are available as Java ME apps. Messenger is not available here. Just do it, you don’t have to ask permission. sir can flare j1 download java ? and how to download java ? No, the Cherry Mobile Flare J1 does not support Java apps and Java can not be downloaded. Sir can Nokia download Java games? Nokia models that support Java ME apps can. will it work in my flare s3? 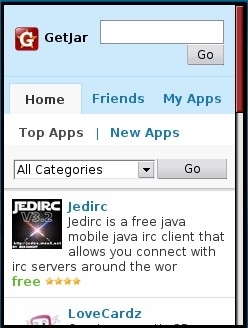 No, Android phones like the Cherry Mobile Flare S3 do not support Java ME apps. can I download a many apps and Java..
You can download as many games as your phone has room for. You cam’t download Java, it has to be built into your phone. How about my samsung galaxy?..is it working? Galaxy phones are Android. They run Android apps only. What’s the title of this page? Did you read it? Sir can android support java ME? No, Tecno phones don’t support Java ME. Can i download many apps in 4gb? 40 100 KB apps or 4 1000 KB apps will fit in 4 GB which is 4000 KB. Can I download a many apps ? You can download as many apps as you want. No, the itel 6900 doesn’t support Java ME apps.